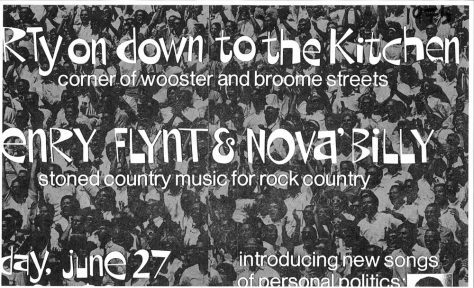 On the evening of June 27, 1975, Henry Flynt & NOVA'BILLY presented an evening entitled "Concert of Avant-Garde Country Music for Dancing" at The Kitchen. They played music composed by Flynt, with Flynt on the electric fiddle, vocals, and electric guitar; Jim McAllister on lead electric guitar; Paul Colin on tenor sax and co-arranger; Don Christensen on drums; Larry Bennett on Fender bass; and Peter Gordon on piano. Flynt along with his backing band played avant-garde hillbilly country music, a style based on Flynt's exploration of non-European music, primarily African American, and Indian, as well as his own compositions in rejection of pop music.